Installed normally at $179 on sale for $149 until end of April, assumes forks are in good working condition. Send forks to us and we can install them for you. Not available as self install kits. no need for stiffer springs to prevent bottoming for better overall feel and handling. Assembled view from bottom showing cylinder insert in bottom of fork slider and the anti-bottoming cone at bottom of cartridge tube. 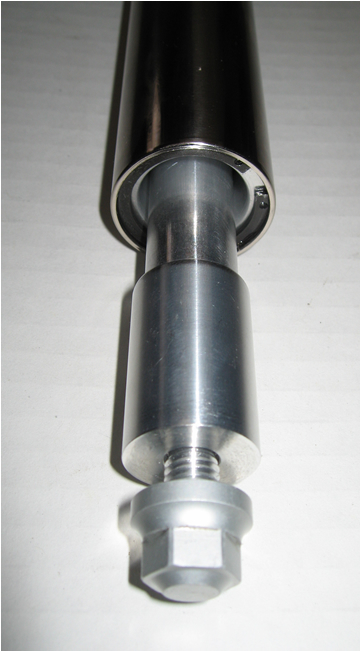 The fork slider leg is slowed down by the resistance created by the cylinder insert and the taper of the anti-bottoming cone. Bottoming is prevented by increasing the resistance created by the taper of the anti-bottoming cone.